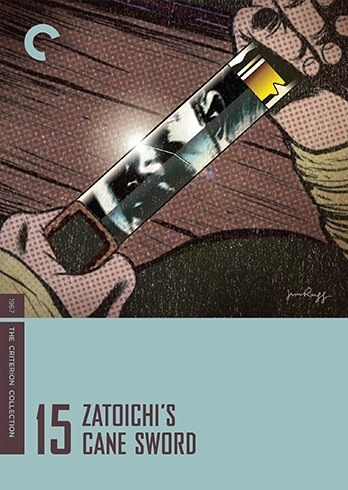 The monumental, phone-book sized boxset of Zatoichi is a treasure, but it’s not something to binge-watch like we do with today’s television series. Instead it is something to treasure at a slower pace. I binge-watched the first three discs, and ultimately got less out of them than these last two discs. We have to remember that these movies came out over a stretch of multiple years, even if some years had 2-3 releases. Compared to other Criterion releases, they are also far lighter, escapist, and formulaic. I’ve found that I appreciate these films much more when I put some time between viewings. With this disc, I found some of the same old frustrating formula, but I also found some refreshing deviations. One of these films was surprisingly good, and could end up being among my favorite of the series. The most noticeable difference between this and previous films is the use of color and a more carefully orchestrated style. Most of the Zatoichi films look good, but they do not always use color motifs or much symbolism. This iteration begins with some thieves outnumbering a helpless victim, who we later learn is Tamekichi. Zatoichi fights them off in scene styled with a classy, blue hued template. Later in the film, Zatoichi meets up again with Tamekichi and the blue hue returns, this time using the sky, the water as a way of natural coloring. Zatoichi later meets another blind man, only this gentleman has been blind from birth. His senses are different than the sword master, and he identifies Zatoichi as an “in betweener” since he was not born blind. This is just another way of setting him as an outcast. Even among blind people, most of whom are born blind, Zatoichi is an outcast. This blind man befriends and mentors Zatoichi, and through his teachings, we see a level of maturity that will carry into the next two films. Of course the main plot includes a gang of local Yakuza that are harassing someone that Zatoichi meets and respects. They are subject to the whims of the local crooks and get extorted. Zatoichi becomes their protector. There is one scene where the local gang roughs up the hero as he stands up for the family. Beaten and bloody, he thinks about unsheathing his sword, but he stays and takes the punishment. This is some of the maturity that he has reached under the tutelage from his blind elder. Later, when he kills someone in front of the boy, he is reprimanded by his wise mentor. 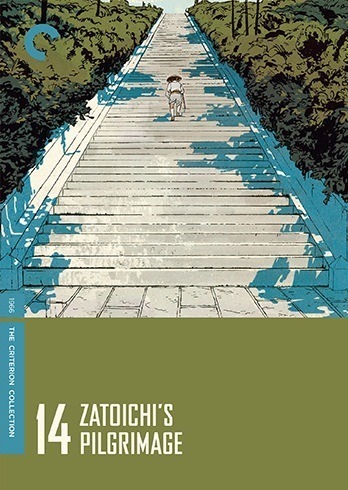 It is also worth touching on the relationship between Zatoichi and the boy. Midway through the series, they have started introducing children to the storyline. Shintarô Katsu plays off children extremely well, and this usually elevates any story. This is the case here. In one scene the child yells out and places himself in front of Zatoichi during a fierce battle with multiple opponents. Since he relies on his senses and instincts during a sword battle, he could easily and inadvertently kill the child. Not this time. He hears the cries and knows the exact moment in order to restrain himself, and then resume once the boy is out of danger. As noted above, the ending has a lot more visual style than most, with the blue color palette and some nice silhouetted shots. This is an above average edition. Usually when I watch a Zatoichi film, I’m rarely caught off guard. To my surprise, Zatoichi’s Pilgrimage took quite a detour from the typical formula. It continues in the same vein as Vengeance in that the total body count is starting to take a psychological toll. He has a vow of non-violence and embarks on a pilgrimage to reach a level of spiritualism. He prays that he does not kill anyone on his journey. That lasts about five minutes of screen time, but the death is somewhat accidental. Someone attacks him and they have an underwater fight. You can guess the result. Again, the shooting style is more sophisticated here. They mix up long shots with close-ups. One effective sequence was when they have a long shot with a horse, and then a close-up of Zatoichi’s sandals that cuts to a close-up of the horse’s hooves. Is Zatoichi basically a service animal wherever he goes? Is he duty bound to who he determines to be the good people of the town? It is rare that the film language speaks on such a high character level. Another good example of camera work is later on when Zatoichi is acting as guardian of a household. They have a nice pan from the characters that enter the house to another room where Zatoichi is kneeling in solitude. One of the strengths in this edition is the focus on character, and not only of Zatoichi, even though they make great strides at fleshing him out – impressive at this stage of the series. The supporting characters are developed well, most notably the female character, the sister of the person that Zatoichi kills against his wishes (and prayers). There is a very touching scene between them that ranks up there as one of the best character moments and performances of the series. He thanks her and gives her money for her burial. You can tell that his compassion is genuine, but he is also romantically drawn to her. She may not reciprocate his advances, but she is grateful, humbled and moved by his honor. The plot is a bit outside of the formula because virtually everyone in the town is morally inept. The gangsters are always terrible, and they are just as thinly drawn here as in all the others. The lower class villagers that are exploited are just as shady, only in a different way. They refuse to cooperate in the fight against Zatoichi, seeing it as a beneficial situation for them either way. If the Blind Swordsman wins, they will be relieved of their burden. If he loses, they will not be blamed or punished. It is cowardly and immoral behavior. The final battle scenes are also quite good. In some respects they reminded me of a John Ford finale. The pacing is patient and allows the tension to build. There is not a rush to just have Zatoichi fight a gazillion people at once and kill them all. They use the locations extremely well, and they add the extra element of arrows being shot at Zatoichi. He has to be more tactical and evasive against this unknown threat, which makes this one of the better action sequences in the series. This was top-notch. I’d say that it is firmly at the top of the series, followed closely by Zatoichi and the Chess Expert. I’m curious to see if this is an anomaly or if this level of quality will continue. My expectations were probably a little too high after Zatoichi’s Pilgrimage. They continue to deviate from the formula somewhat, and this time they introduce some supernatural elements that work in some ways and not in others. One part of the Zatoichi myth that I find perplexing is the gambling. I know that I shouldn’t be complaining about suspending disbelief in a series with a blind guy taking out dozens of opponents in one battle, but the gambling thing really gets me. Zatoichi is almost constantly able to “see” through any cheating that takes place with the organized dice games, and he uses them to his advantage in order to gain riches. They had gotten away from the gambling aspect in the last few films, just as they had gotten away from the lazy, mooching aspect of his character, and I think the series benefited from this change. Zatoichi encounters an older man who used to be skilled at hand-making swords. When he sees the cane-sword, he recognizes it as a special, mystical blade that enhances the odds for Zatoichi to win in battle. Without the sword or his ability, he would have inevitable lost a battle and his life by now. The only problem is that the sword has nearly reached the end of its usefulness and will break soon. It is predicted to only function for one more kill. This is a bit much to swallow. After 15 films, we finally learn that he has a magical sword. This seems to be a little too easy for the writers to invent at this point, but of course this is a superhero fantasy tale and you have to roll with it. On the other hand, the limited use of the sword works in that Zatoichi has no choice but to sheath his sword. We see him fight with a cane or get otherwise creative while saving the sword for when he needs it. Spoiler alert, he will use it and it pays off nicely. The premise is that Zatoichi shacks up at a hotel as a masseur, which of course is taken advantage of by local gangsters. There is a woman that he connects with, although not as effectively as the last two films. There are some twists and turns that are a little more melodramatic and the plot is more convoluted than usual. On top of that, the running time is longer than most films to date and you can tell. This movie dragged a little bit towards the end. I found that it was bogged down with exposition as they tried to lead to the final conflict, yet there was overall less action than most Zatoichi films. 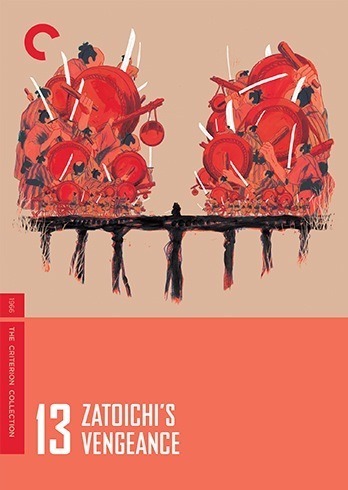 Posted on March 24, 2015, in Blog and tagged criterion, film, Shintarô Katsu, the criterion collection, zatoichi. Bookmark the permalink. 5 Comments. You are one prolific writer, Aaron. And a real movie geek. My wife and I belong to a local theater that runs many indie films, so we get to see a lot of movies, but you have us beat by leaps and bounds. I can tell you love it. It shows. Thanks, Jim. I’ll take it as a compliment. I’m somewhat prolific, but a lot of these have been drafts on my laptop for a long time. One day I’ll post about my journey towards being a cinephile. The short version is that I always loved movies and even wrote about them at times, and then I studied them in college. So my interests are a little academic now, which is why I focus on high brow movies. Trust me, I see the comic book escapist ones too, just they aren’t as challenging or interesting to write about. I appreciate you following me from one subject to another. Hopefully I’ll be balancing both at some point.